Vajiravudh Day is celebrated annually in Thailand on November 25. This national observance was established to commemorate the death of King Vajiravudh in 1925. Vajiravudh was born on January 1, 1881. He was crowned on October 23, 1910, the day marked the beginning of his reign. Vajiravudh is well known for his efforts towards creation and promotion of the Siam nationalism. 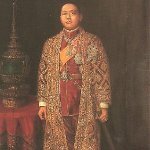 His reign was characterized by the national movement towards democracy, keeping the independence of Siam and its minimal participation in World War I. King Vajiravudh was a prolific author, poet and playwright. He is well known for writing over 60 plays and introducing the detective stories to Thai literature. He translated to Thai William Shakespeare's plays, Agatha Christi’s detective novels, Ramayana and Mahabharata epics. King Vajiravudh was a very important figure in establishment of the Thai nationalism and its literature, that is why the anniversary of the death of one of the greatest kings is annually commemorated by all people in Thailand.